For 1977, TYCO introduces a new HO-scale diesel locomotive, EMD’s SD24, and puts that new offering in The Comin’ Round The Mountain (No. 7327) train set. 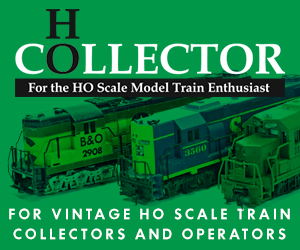 Portrayed in TYCO’s 1977 catalog with Atlas-Roco HO-scale model stand-ins, the new SD24 saw its debut year duties included serving as the power for The Comin’ Round The Mountain train set. 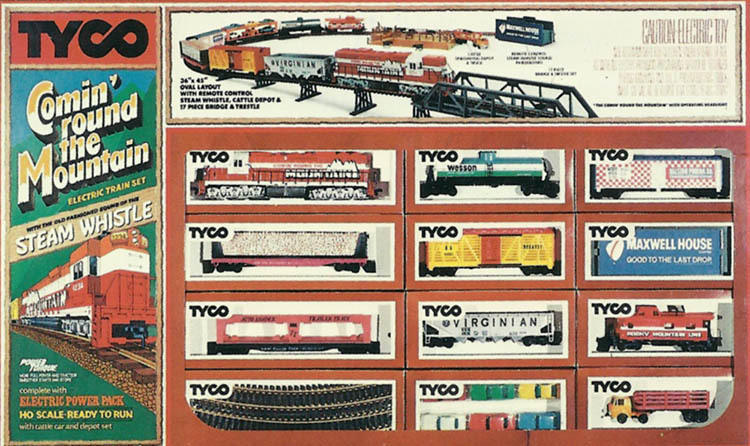 Look closely at the artwork on the left side of the train set box lid and you’ll see what looks more like TYCO’s Super 630, than the new SD24. The set provided the fictional Rocky Mountain Lines SD24 with matching streamline-cupola caboose, along with a Wesson tank car, Purina reefer, Southern pulpwood car, Durango cattle car, Virginian hopper car, and Frisco auto-loader with six autos. Accompanying the yellow-and-orange Durango cattle car was the rest of what made up TYCO’s separate-sale Cattle Car & Depot Set (No. 935), which included the loading pen with fencing, eight cows, and truck cab with cattle trailer. This set also provided the Remote Control Steam Whistle in Billboard (No. 934) and 17-piece Bridge & Trestle set (No. 907). Thanks to the bridge and piers, the 36 x 45 inch track plan could be elevated. TYCO’s standard power pack was also present in this 1977 release. The set returned in TYCO’s 1978 catalog with no changes. For 1979, TYCO revises its Comin’ Round The Mountain set (No. 7314) and adds the Operating Crossing Gate (No. 908) and drops the Cattle Car & Depot Set, Steam Whistle in Billboard, and the 17-piece Bridge & Trestle set. The set retains its 36 x 45 inch oval track plan and standard power pack. Rolling stock for this 1979 version provides a Burlington Northern hopper, Texaco tank car, and keeps the Frisco auto-loader with six autos, as well as the matching Rocky Mountain Lines caboose from the previous train set’s contents. The revised Comin’ Round The Mountain for 1979 shows off new artwork on the train set box lid that includes a better representation of the SD24 diesel locomotive. 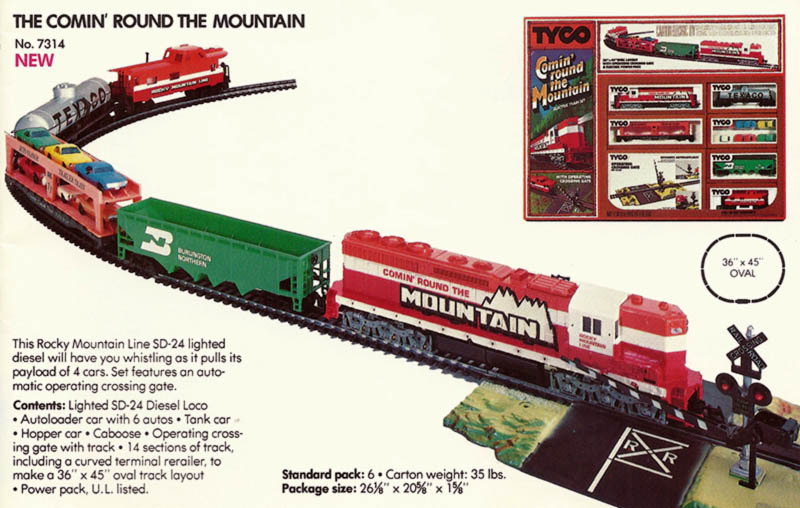 TYCO’s catalog image for 1979, at least on page 5 for this train set, includes what appears to be an actual production Rocky Mountain Lines SD24, though it is missing its handrails. The absence of handrails for diesel locomotives became more and more common beginning in the second half of the 1970s and through the 1980s and into the final years of TYCO trains in 1993. This second Comin’ Round The Mountain train set doesn’t return for 1980. TYCO’s SD24 diesel locomotive came out in 1977 and among the original road names offered was the fictional Rocky Mountain Lines release (No. 239-27). The additional first production TYCO SD24 roads included Chicago, Burlington & Quincy (No. 239-13) and Union Pacific (No. 239-23). TYCO adds a Chessie System SD24 (No. 239-03) in 1980 and Rio Grande (No. 239-74) in 1982. The red, orange, and white Rocky Mountain Lines SD24 makes it final catalog appearance in 1979.